This article was written by invitation for One Green Planet and was posted there on March 24, 2016. Contrary to what many people think, poultry is not a low fat, low cholesterol food. Like all meat, poultry is permeated with artery-clogging saturated fat that can’t be cut away. And the cholesterol content of chicken or turkey is comparable to that of red meat – about 25 milligrams per ounce. Unlatch the door of the typical 500-foot-long chicken house, and a blanket of sepia-white baby birds not making a peep stare at you through the dark haze of nauseating toxic gases and floating debris of feathers, skin particles, and pathogens. Though just a few weeks old, most chickens bred for the meat industry are too painfully lame to stand up normally, let alone walk, due to their forced rapid growth rate and heavy bodies that feel when you pick one up like a sad sack of wet cement. I have come to know these birds well through decades of sanctuary care. 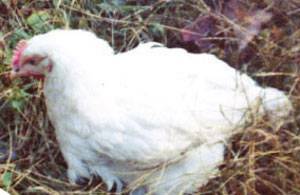 Five years before founding United Poultry Concerns in 1990, I rescued a crippled and abandoned “broiler” chicken named Viva, who I like to say, started it all because of how deeply she and her sweetness seeped into me back when I was considering starting an advocacy organization for farmed animals. Though burdened with a manmade body, there was nothing inferior about her personally. Viva, "The chicken who started it all..."
Viva was expressive, responsive, communicative, affectionate, and alert. She already had a voice including her soft little heart melting trills of contentment. I wish that everyone who thinks of chicken as just food whether “healthy” or sickening could hear those trills and feel the beating pulse that I felt inside her body each time I held her close.